“Kill Your Darlings” also refers to adorable shoes that no longer serve one’s life story. These are size 10 (EU 40)…any takers? While buying a box of matzah a few days ago, I remembered that one of the purposes of this unleavened product is to instruct the eater to be humble and not let the ego run the show…at least for the eight days of Passover, if not longer. Good writing also demands we put our egos aside…all the time. We need to remove all leavening, e.g. the huffy (unresolved anger, resentment), the puffy (esoteric vocabulary, bragging) and the fluffy (extraneous words, rambling scenes), so that we can subsume ourselves to the universal tale we are trying to tell. In memoir and personal essay, this could mean exposing aspects of one’s personality or life that ego works hard to protect. We need to be willing to be the a**hole on the page. But also likable. As I’ve learned in workshop, it’s tough to consistently pull that one off, at least in a first draft. Writing, in turn, has even better advice for another spring rite, that of cleaning and removing clutter. Know the phrase, “Kill your darlings?” It refers to those sentences or passages that you might be in love with, or spent hours perfecting, except they are not critical to what you are really trying to say. The prose might be stunning, worthy of a standing ovation or prize, but if the words don’t serve, out they go! As I confront an overstuffed closet, I realize I need to kill a darling pair of pumps I bought for a family event half a decade ago and haven’t worn since. 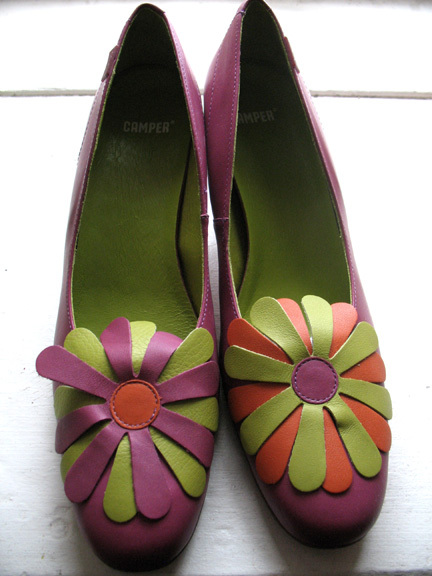 Every so often, I open the box to admire the craftsmanship of the magenta, orange and green leather flowers adorning each shoe. My puffy ego tells me to hang onto them: they were expensive, made in Europe, oh-so-cute. But they take up valuable space and no longer serve the person I am today (or the current shape of my feet). Out they go, even if it feels like a tiny death. Sniff.